See an overview of the contents. Check out the highlights of the Spring 2004 issue. Coming May 7th! Check out the results of the Preditors and Editors (tm) 2003 Readers Poll. Twilight Times has been in the top twenty ezines on the web for fiction and poetry for the past five years! We are in the process of moving all previous issues of Twilight Times ezine to The Etext Archives. Please inform us regarding any broken links, missing graphics, etc. If you enjoy the stories you've read in Twilight Times, then you'll also enjoy books published by Twilight Times Books. More great stories, only longer! Nine Lives and Three Wishes, a YA fantasy by Jennifer St. Clair. Saga of Rim, a YA fantasy by Cecilia Wennerström. [Publisher's note.] 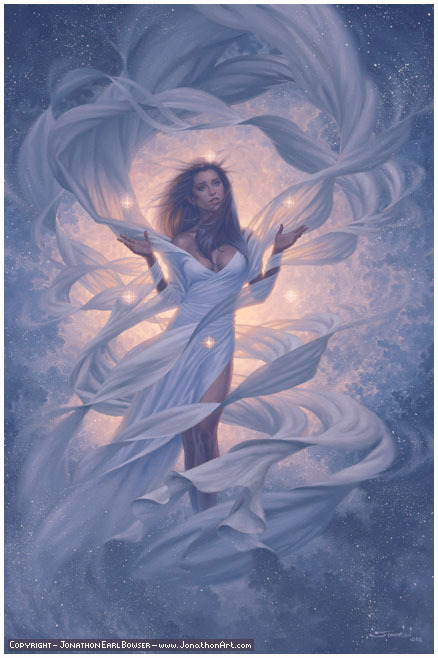 Limited-Edition prints of "Luminous Wind" are available. Signed by the artist, Jonathan Earl Bowser. Behold the Eyes of Light, a fantasy novel by G. Geauterre, available from Twilight Times Books. "A heroine born of legend travels across dimensional pathways and receives training at the hands of near mythical beings. She will need all the help she can get to save Ooroomooriss, the great cat world and her home, from extinction. If you enjoy viewing Twilight Times ezine, please consider making a donation to the cause via Pay Pal. This page last updated 05-02-04. Domain hosted by SFF NET.